Prominent & Leading Manufacturer from Coimbatore, we offer conveyor bucket, conveyor chain and chain sprocket. 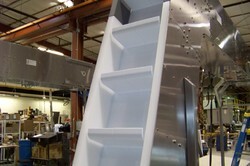 With the rich expertise in the industry, we are manufacturing a wide range of Conveyor Bucket. These buckets are also provided with stainless steel and mild steel for extensive application in rice mills and cement factories. These products are used with the conveyor belt and help in the movement of bulk and heavy materials. .These are designed in a manner to ensure that the products do not fall off or roll to the sides. We are the leading manufacturer and supplier of Conveyor Bucket in Tamilnadu, Kerala, Coimbatore, Tirupur, Karur, Salem, Chennai etc. 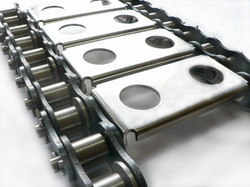 We are engaged in manufacturing a wide range of Conveyor Chain to the clients. These chains are highly durable in nature and can easily work in glitches. Offered chains are widely accredited for their construction and built in an organized and systematic manner. These chains are used in sugar, fertilizer, cement and other such industries for the purpose of moving material from place to another. We are the leading manufacturer and supplier of Conveyor Chain in Tamilnadu, Kerala, Coimbatore, Tirupur, Karur, Salem, Chennai etc. We are the manufacturer of a wide range of Chain Sprocket which is primarily used for applications like carrying out operations and are extremely strong due to which it can successfully carry a heavy load. This is generally used to transmit rotary motion between two shafts and to provide linear motion to a track and tape etc. These products are manufactured using excellent quality material that is sourced from most trusted and reliable vendors of the market. 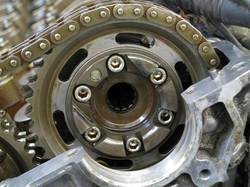 We are the leading manufacturer and supplier of Chain Sprocket in Tamilnadu, Kerala, Coimbatore, Tirupur, Karur, Salem, Chennai etc.